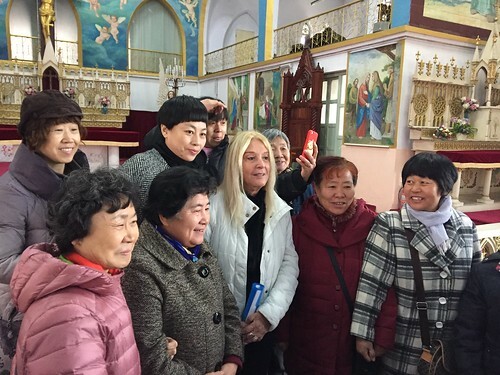 After Sr. Mary returned to Beijing, all of Vassula’s friends who live in that part of the world took part in organizing this long-awaited return to the biggest country in Asia. 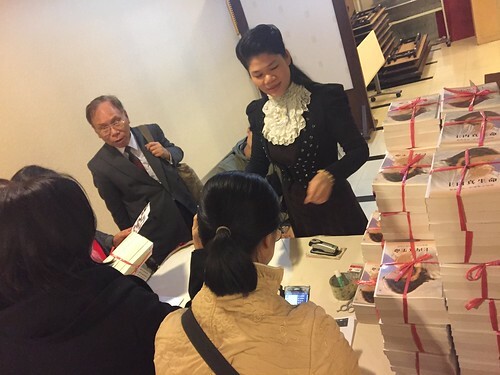 The TLIG Taiwan Association instantly raised the funds to cover all necessary expenses for flights and accommodations, and more importantly, continued their efforts towards translating and publishing the TLIG messages in Mandarin, the dominant language of China. In 2008, Vassula brought True Life in God to China, speaking in several churches and at a seminary in Hebei province in northern China. This province is home to one million Catholics. The publishers of the TLIG messages are located in Shijiazhuang, the capital city of Hebei. Thanks to Fr. 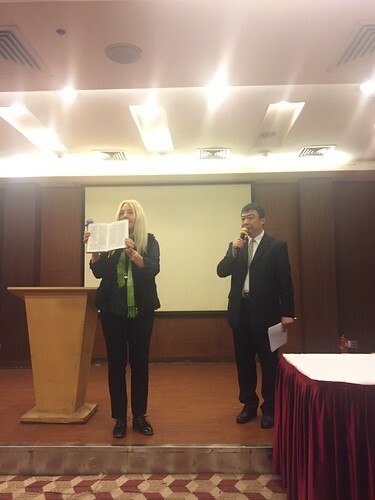 John Baptist Zhang, the director of Faith Press, along with an ardent TLIG reader, Luke Kn Lam, Vassula’s second visit to China was organized for the cities of Beijing, Tangshan, and Guangzhou. Vassula & Fr. Joseph Iannuzzi take a stroll in frosty but sunny Beijing with China with me (Cecilia Lutz) and organizers Luke & Marie. Arriving at Beijing Airport with her traveling companions, Fr. Joseph Iannuzzi and myself, Vassula was met by Luke Kn Lam who had flown from Guangzhou in southern China. Marie-Madeleine Friberg, my daughter from TLIG Switzerland who had come from Geneva, was also with us. 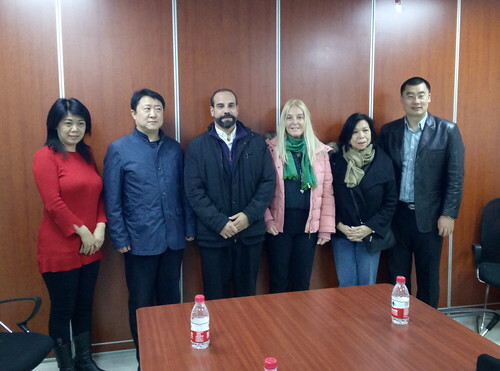 Amidst the wintery cold and frosty winds of Beijing, Vassula began her mission with Fr. Joseph, Luke Kn Lam, and Marie from Beijing West Church. 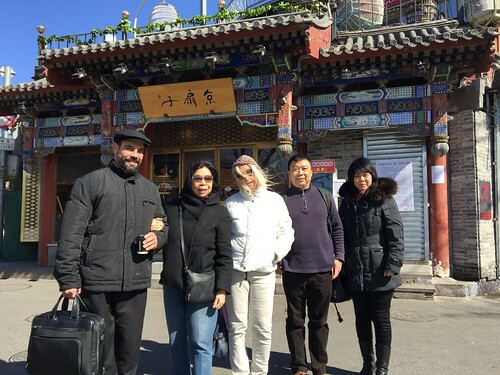 Vassula was welcomed by the parish priest of Beijing West Church, Fr. Zhang, together with many priests of the diocese, including Fr. Simon, parish priest of Beijing’s South Cathedral. Luke then started his heavy role as interpreter, since in many Asian countries especially China, English is not spoken. 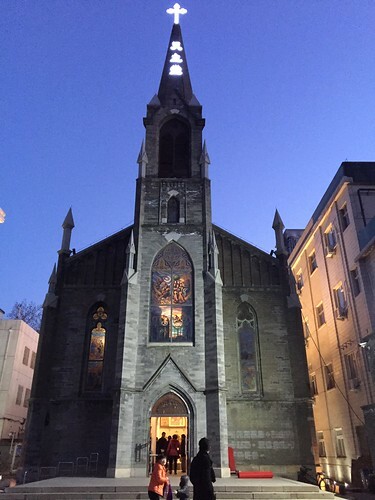 The West church of Beijing is dedicated to Our Lady of Mount Carmel and is located in the western part of the capital of China. It was built in 1723, by an Italian priest and was destroyed three times by earthquakes. It is a beautiful church, well-preserved, and is a peaceful haven for its parishioners in this bustling city. Just before the 6:30 p.m. public meeting, Vassula and the organizers were surprised to hear that the church was full! Its 350 seats were fully occupied, with the remaining audience standing. 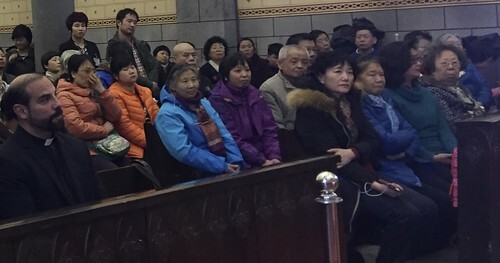 Many were parishioners from the Beijing South Cathedral. After the meeting, many books were sold and Fr. Zhang, of Faith Press, publishers of the True Life in God books since 2008, shared a delicious dinner with us. He arranged for Vassula and Fr. Joseph to meet the bishop of Haimen in Beijing the following day. Accompanied by Fr. Zhang and Fr. Joseph, Vassula met the bishop of Haimen, His Excellency Joseph Bin Shen, who very warmly welcomed her and was so intrigued to hear of the many conversions that the Messages bring. Vassula told him about Padre Milheiro of TLIG Portugal who had translated and published the books in Portuguese many years ago. In his prison apostolate, he introduced and gave True Life in God books to the prisoners. Reading the Messages changed their lives and transformed their prisons into monasteries, as the inmates took down the earthly posters from their walls and replaced them with heavenly ones. They read, prayed, and were filled with hope for their lives and for their families while undergoing repentance and purification, and by returning to the Church and the Sacraments. Several books with these prisoners’ testimonies have been printed, showing how the Messages brought them back to God. Bishop Joseph was very impressed with Vassula’s mission and extended his assistance towards furthering translations, along with the publication of the TLIG One Book in Chinese. China's Catholic Church announced the opening of the country’s largest seminary in Beijing on September 28, 2006. This seminary is the heart of the Chinese Catholic Church. Vassula is welcomed to the National Seminary of Beijing. At the start of the meeting, Fr. Joseph spoke to the audience, which was comprised of seminarians and some laypeople. As an exorcist, having obtained his doctorate in Dogmatic and Mystical Theology in Rome, he introduced the True Life in God messages of Our Lord Jesus Christ given to the mystic, Vassula Rydén. “A mystic is someone through whom God speaks,” Father Joseph explained. Fr. Joseph explained: “In this article one discovers the progressive disclosure (explication) of public revelation. If, on the one hand, this article relates that Jesus revealed to us everything we need for salvation, no new ‘public’ revelation (the Deposit of Faith) is to be expected; on the other hand, it affirms that not everything in the public revelation of Christ was revealed to us ‘explicitly’! Concerning Jesus’ unexplicated doctrines, I recall Jesus’ words to his disciples before departing from this world: “I still have many things to say to you, but they would be too much for you to bear now. However, when the Spirit of truth comes, he will teach you all the truth since he will not be speaking of his own accord, but will say only what he has been told; and he will reveal to you the things to come.” (John 16:12-13) True Life in God is God’s Work revealed to us in our times through the Holy Spirit." Jesus formed her to give His Message to all the world, to an apostatised generation. He said “Go and Christianize a de-christianized society!” (February 2, 1999) He then prepared her and sent her out to eighty-five countries to give His Message of True Life in God. Vassula spoke of the Holy Spirit’s role in repentance and in discerning God’s Will for each one of us. In the Messages, one learns what is Repentance - the soul must repudiate its evil thoughts and evil acts as well. If a person is humble, the Holy Spirit will easily find His Way in that person. He will shatter all imperfections so as to prepare him for union with God. 1. Q: Is the second Pentecost based on the Bible or on your writings? A: Pope John XXIII was praying to Jesus for the Unity of the Churches and for the second Pentecost. Thirty years ago, laypeople never thought of forming prayer groups and praying. Today, there are many prayer groups: of St. Padre Pio, St. Faustina, etc. Many laypeople are searching for God. Through True Life in God, there are many prayer groups around the world, as there is a thirst for God like never before. Laypeople receive gifts from the Holy Spirit. Why? Because God sees that the world has turned completely evil. We are now living in the End of Times which St. Paul talks about in 2 Thessalonians 2. The two signs indicating that we are at the end of this epoch are the apostasy & the spirit of rebellion. 2. Q: What can we do to prepare for the second Pentecost? A: Tell the people about the sweetness of God. 3. Q: What does knowing God and understanding God mean? A: In Jeremiah 9: 22-23, God tells the prophet that He is not impressed with a valiant man for his valor, or a rich man for his riches. What He likes is someone who knows and understands Him; for God this is important. The more we penetrate into God, the more we understand Him. 4. Q: We want to do God’s Will; but within us, do we truly respond to His Will? 5. Q: Can you tell us about the Notification? A: It was clarified in 2004 by the then Cardinal Ratzinger in the CDF. You can find many articles concerning the notification and the clarification by Cardinal Joseph Ratzinger on the TLIG.org website (click here). That article has the official July 10, 2004 letter and clarification. You can find many articles concerning the notification and the clarification by Cardinal Joseph Ratzinger on the TLIG.org website. Click on the word "Search" in the upper right corner. Then type Congregation for the Doctrine of Faith in the Search box. Many articles on the notification will appear including one under the title of "Cardinal Joseph Ratzinger." That article has the official July 10, 2004 letter and clarification. The other articles have pertinent material regarding the same subject. In the back of the TLIG One Book, Appendix B contains all of the questions by the CDF along with my answers. It has now been thirty-three years since I was called by God, and since then, there has been manifested much good fruit. We have had thousands of conversions and the converted people all go back to the sacraments of the Church. Satan can make miracles, but can NEVER bring back souls to the sacraments. Cardinal Ratzinger approved True Life in God and many other theologians like Fr. O’Carroll, Fr. O’Connor, Msgr. Laurentin, and Fr. Joseph have written books on the Messages. If it were for Satan, there would have been no conversions, and the Messages would not have lasted thirty-three years. Tangshan is an industrial town, located 180 kilometers from Beijing. 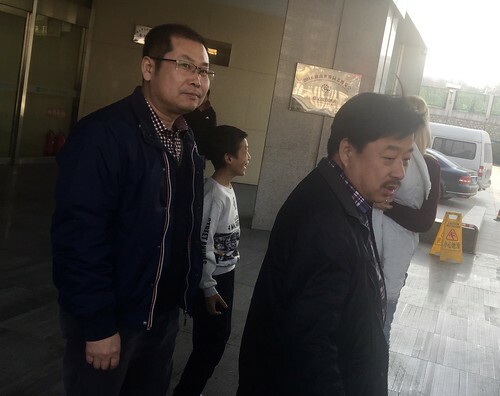 On arrival at the Tangshan Steel Hotel, Vassula was met by the Vicar General of the Tangshan Diocese, Fr. John Ren and the parish priest of the Immaculate Conception Cathedral, Fr. 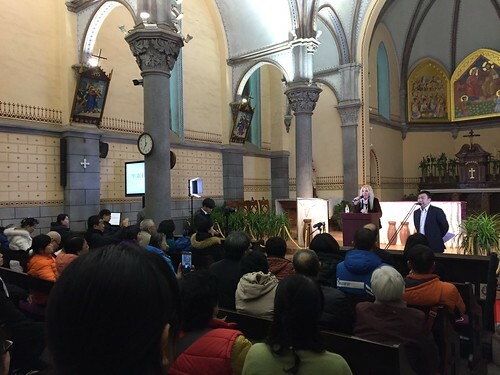 Peter Hua, where Vassula was invited to speak on Sunday after the 8:30 a.m. Mass. 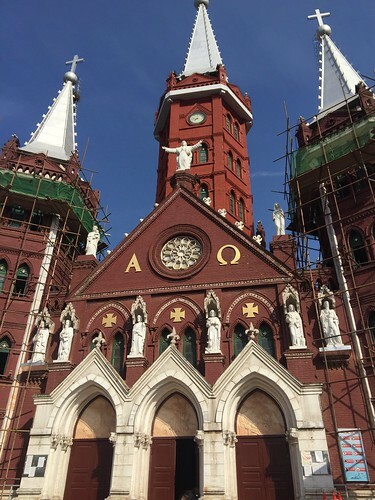 The Immaculate Conception Cathedral was built after the great 1976 earthquake which devastated the city and caused over two hundred thousand deaths. 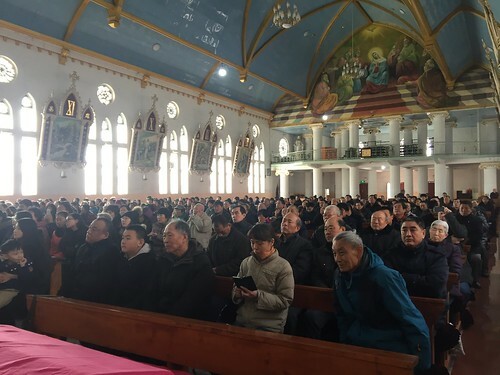 The Roman Catholic population in the Tangshan Diocese is now thirty thousand, of which six thousand live in the city of Tangshan. Thirty eight priests are now serving the diocese. Fr. John Ren shared with us the history of Christianity in China. In the 7th century, Christianity entered China through the Silk Road, during the Tang Dynasty. It was brought by Persians involved in the Nestorian heresy. In 1953, during the Cultural Revolution of Mao Tse Tung, Christian churches and Buddhist temples were destroyed, missionaries were expelled, and priests were jailed. In the eighties, after Mao’s death, the people were again allowed to come out of hiding and worship. They were filled with fervor to rebuild their churches. Nonetheless, relations between Church and State remain strained. After the 8:30 a.m. Mass, about 400 parishioners remained in the church to hear Vassula’s talk. Fr. Joseph presented a brief introduction, and after Vassula recited the Lord’s Prayer in Aramaic, she began her talk by stating the fact that God purposefully brought her to the people of Tangshan as a postman who delivers God’s love letter to the entire world. The audience listened intently to Vassula as she gave witness to her experience of God’s call in her life, and introduced True Life in God and all its themes. 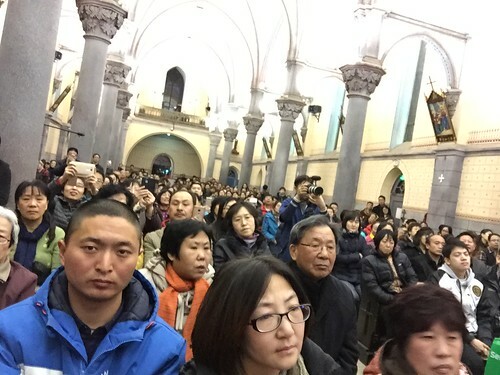 Although the interior of this awesomely beautiful cathedral was freezing cold, one could feel the warmth and appreciation of the people of Tangshan to have God’s messenger come to their city and speak of God’s Love for all His children. 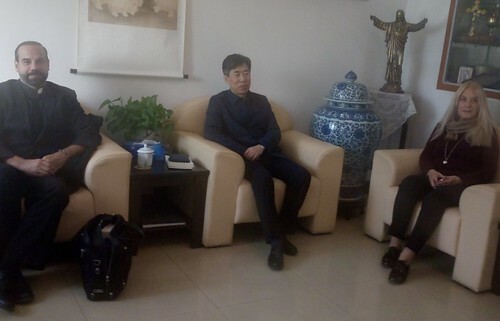 At the onset of plans for Vassula to visit China, Sr. Augustine of TLIG Taiwan recommended Luke Kn Lam to be Vassula’s interpreter. Luke had attended the TLIG retreat in Loutraki in May of 2016, and was happy that Vassula would visit his country. He was ready to assist in any way. When we found out he was from Guangzhou in southern China, Vassula accepted the invitation to speak in that city. It is interesting to know that like the majority of Chinese today, living in China after the Cultural Revolution which suppressed all religions, Luke was an atheist. He came to the Catholic Church because of his attraction to prayer and the Liturgy. About four years ago, a catechist whose prayers impressed him very much, told him about True Life in God and recommended the Messages. In the beginning, the writings appeared to him very soft and syrupy, and had a too feminine tone for his liking…until sometime later. When he learned to pray the rosary regularly, his heart opened to the Messages. He immersed himself in True Life in God and learned to pray from his heart; he learned to know God and understand what He wants. The reason he is on fire to promulgate the Messages of True Life in God is very simple; he says that God is speaking to us; we should listen to Him and respond to Him. Luke is now a warrior for True Life in God. By the time Vassula reached Guangzhou, there was news of opposition against her by some clergy in Beijing. The Catholic bishop of Guangzhou whom Luke had contacted earlier and who seemed open to the Messages, suddenly avoided him. The parish priest of the church who was scheduled to receive Vassula for a public meeting closed his doors! This is not unusual for Vassula’s mission. In the 31 years of her mission, having traveled to eighty-five countries and having given over one thousand talks, Vassula has always experienced persecution and opposition as part of the program. News of the 1995 Notification is always a focus, but the fact that the Congregation for the Doctrine of the Faith under then Cardinal Ratzinger had studied the Messages for two and a half years and had clarified all the questions is totally ignored. In November 2004, Cardinal Ratzinger personally received Vassula to tell her the Notification had been modified. In 2005, the Imprimatur and Nihil Obstat were given to the Messages. None of these positive updates are brought to light. Fr. Joseph Iannuzzi immediately responded to this opposition by sending all the documents needed in defense of Vassula and True Life in God. Of course, at this point the plans for the public meeting were demolished, and the organizer, Luke, had to find an alternative venue at the last minute. A conference room was found at the other side of town, and many who knew of the Messages and wanted to hear Vassula speak were not able to come. All is in the Lord’s Hands. We had done our best; He will do the rest. 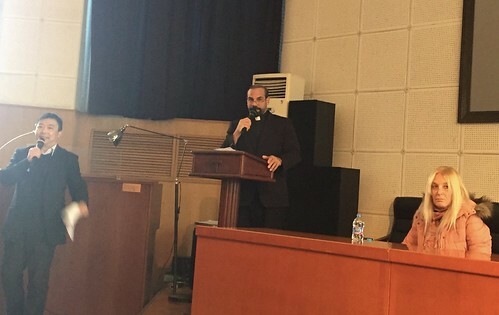 Before the start of the meeting, Vassula was introduced to a pastor, the Rev. Lianshan Pei, who is a professor of Church History in the Guangdong Union Theological Seminary. During her talk, Vassula introduced the One Book English edition of the Messages to the audience. Only four volumes of the TLIG Messages have been translated in Chinese. An effort is underway towards the translation of all twelve volumes and the creation of the One Book in Chinese. Book sales were successful, hopefully all the books will soon be translated and published. 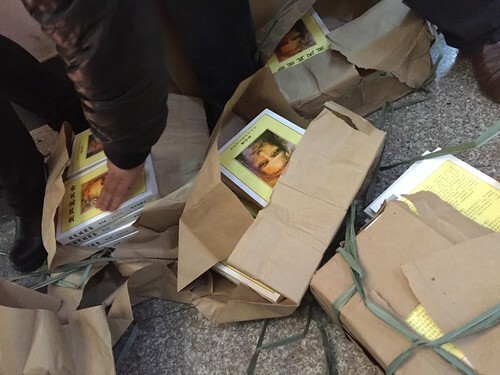 All four translated volumes and the TLIG Prayer Guides were sold in bundles. We hope TLIG prayer groups will be formed in China. The great enthusiasm of the audiences in Beijing, Tangshan, and Guangzhou indicate a great potential towards the dissemination of True Life in God and its Messages in China. We thank Luke and Fr. John B. Zhang for having organized these events which provided this opportunity for Vassula to witness for True Life in God in China. Our thanks also go to His Excellency Bishop Joseph Bin Shen for welcoming Vassula and her mission. 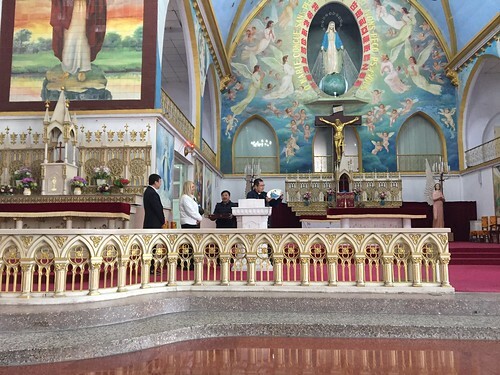 We also thank the parish priests of the churches that received Vassula, Marie from Beijing West Church Parish, along with the laypeople who helped and showed their hospitality to Vassula, Fr. Joseph, Marie-Madeleine Friberg, and me. May God bless China! Submitted by: Cecilia B. Lutz.